Automate the build and delivery of a sql change script artifact, for any database environment, to a designated release location using a parameterized build. Automate the build and publishing of the SSDT project’s changes directly to any database environment using a parameterized build. Picking up where part one of this three-part series left off, we are ready to convert the Adventure Works VS 2010 database project and associated server project to the new SSDT project type. Once converted, we will create an additional Solution configuration for Production. Finally, we will publish (vs. deploy) changes to database project’s schema to both the Development and Production environments. Note that Microsoft refers to the new format as either SSDT project type or SQL Server Database Project. I chose the prior in this post, it seemed clearer. Microsoft could not have made the conversion to the new SSDT project-type any simpler. 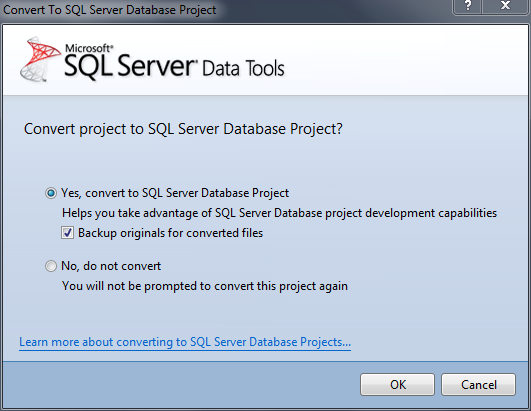 Right-click on the Development server project and select ‘Convert to SQL Server Database project’. Select ‘Yes’, select ‘Backup originals for converted files’, and click ‘OK’. The conversion process should take only a minute or two. Following that, you are presented with a Conversion Report when the process is complete. The report should show the successful conversion to the SSDT project type. Repeat this process for the AdventureWorks2008 database project. Again, you see a Conversion Report when complete. It should also not contain any errors, nor files marked as ‘Not converted’. Reviewing the Conversion Report for the databae project, note the change to the primary project file. This is the first key difference between the VS 2010 project types and the new SSDT project types. The project file was converted from ‘AdventureWorks2008.dbproj’ to ‘AdventureWorks2008.sqlproj’ (see Conversion Report screen grab, above). 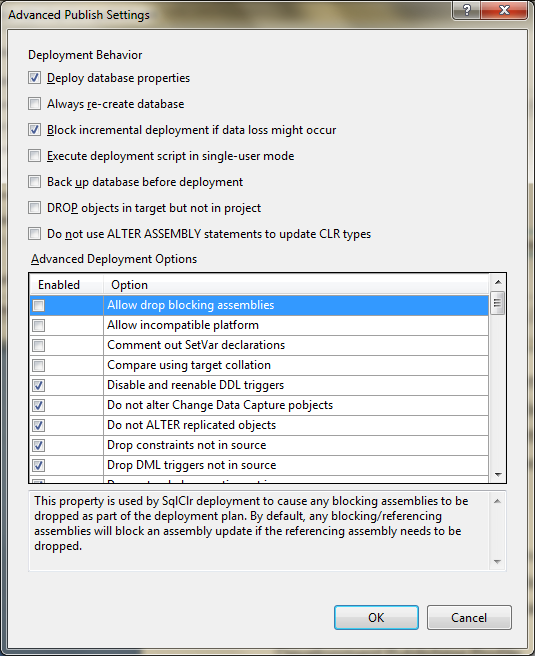 Although the earlier project file with the ‘.dbproj’ file suffix is still in the project’s file directory, the Visual Studio Solution is now associated with the new ‘.sqlproj’ project file. This is the same for the server project. The ‘.dbproj’ files are no longer needed. You can drop then from the project’s file directory or from your source control system. This will prevent any confusion going forward. The second change you will note after the conversion is in the Solution Explorer tab. Each project has three items with the file suffix ‘.publish.xml’. These are publishing profiles. There are profiles for the each Solution configuration – Debug, Release, and Development. A publishing profile has all the settings necessary to publish changes made to the SSDT database project to a specific database environment. As part of the conversion to SSDT, all existing project settings migrated into the current project. Portions of the configuration-specific settings stay in the converted Solution configurations, while publish-specific settings are in the publishing profiles. Publishing profiles, like pre- and post-deployment scripts, are not part of the build. Select a profile in the Project Explorer tab. Note the ‘Build Action’ property in the Properties tab is set to ‘None’. There are also new settings in the converted projects. They support newer technologies like SSDT, SQL 2012, and Azure. As part of our first major conversion to SSDT, took the opportunity to review all project and publish settings with our database developers and DBAs. We stove to understand all the setting’s purpose and make sure they were correctly configured and documented for each of our many database environments. To test the successful conversion of the both project to the SSDT project types, select the Development Solution configuration and perform a Rebuild on the Solution. In the Build section of the Output tab, you should see both projects built successfully. 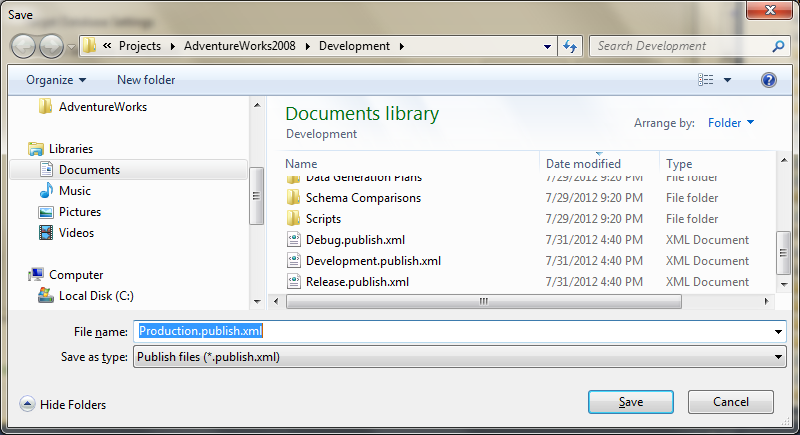 Right-click on the ‘Development.publish.xml’ file in the AdventureWorks2008 project and select ‘Publish…’ Wait for the project to build. Selecting Publish or opening a publishing profile causes the project to build. Afterwards, you should see the ‘Publish Database’ window appear. Here is where you change the settings of Development profile. When converting the Adventure Works project to SSDT, I’ve found the database connection information does not migrate to the profile. Setup the ‘Target database connection’ information in the ‘Connection Properties’ pop-up window by clicking ‘Edit…’. When finished, click ‘OK’ to return to the ‘Publish Database’ window. Finally, save the revised Development publishing profile by clicking ‘Save Profile As…’. I will not cover the specific profile settings, accessed by clicking ‘Advanced…’. Many of these settings will be specific to your environments and workflows. They can be left as default for this demonstration. Without leaving the ‘Publish Database’ window, click ‘Generate Script’. As in the first post, this action will initiate a schema comparison resulting the generation of a script that aggregates all the schema changes to the project, not already reflected in the database. The script represents the schema ‘delta’ (the difference) between the project and the database. The script will automatically open in Visual Studio’s main window after being created. In the ‘Data Tools Operations’ tab you should see messages indicating generation of the script was successful. Also included in the script, along with the schema changes, are any pre- and post-deployment scripts. You should see the single post-deployment script that we created in part one of this series. Pre- and post-deployment scripts are always included in the script, whether or not they have already been executed. This is why it is imperative that pre- and post-deployment scripts are re-runnable. Scripts must have the ability to be executed more than once without producing unintended changes to the database. Next, right-click on the ‘Development.publish.xml’ file, and select ‘Publish…’. This will return you to the same window you were just in to generate the script. Click ‘Publish’. Again, in the ‘Data Tools Operations’ tab you should see messages that the publish operation completed successfully. Congratulations, you have completed and tested conversion of the Adventure Works database project to SSDT project type. Note with SSDT, the term ‘Deploy’, which refers to a specific MSBuild target, is replaced with ‘Publish’, a SSDT-specific build target. Instead of deploying changes to the database, like we did in the first post, we will publish changes with SSDT. 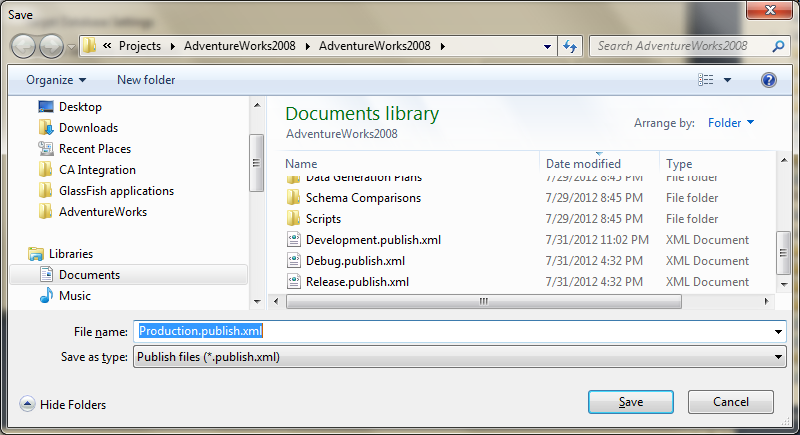 To understand how MSBuild is able to call the new SSDT Publish target, open the AdventureWorks2008.sqlproj file by right-clicking on the project and selecting ‘Edit Project File’. In the project file’s xml you will find an ‘Import’ tag that imports the SSDT targets into the project, making them accessible to MSBuild. 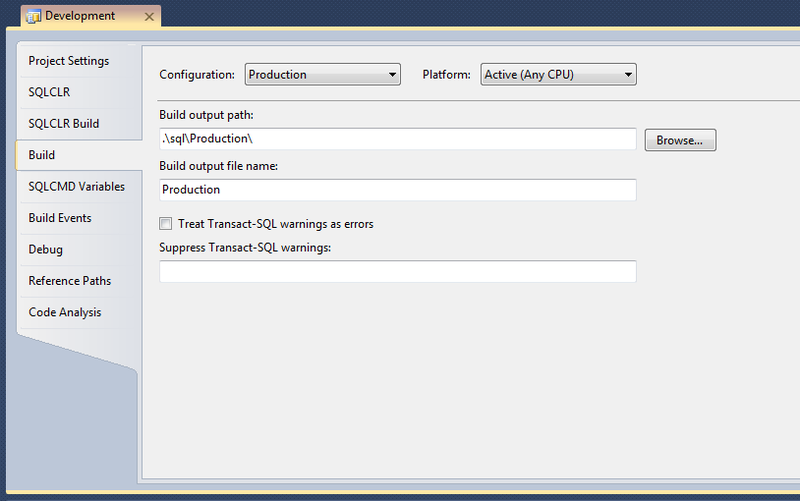 Between posts, I installed another instance of SQL Server 2008 R2, named ‘Production’. Into this instance I installed another copy of the Adventure Works database. I added the same ‘aw_dev’ user that we used in Development, with the same permissions. 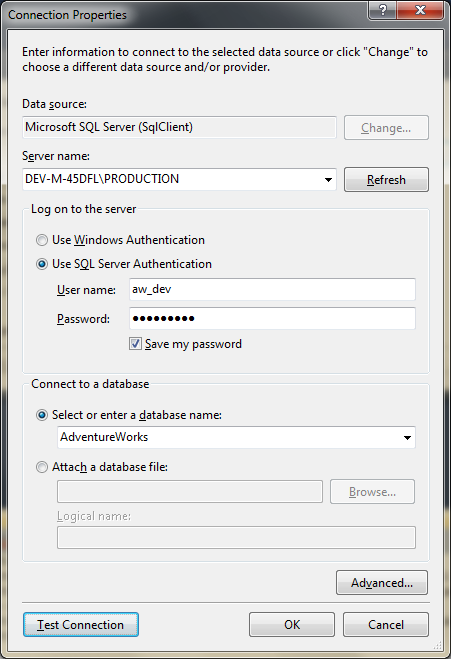 This SQL Server instance and Adventure Works database simulates a second database environment, Production. Normally, this instance would be installed on to separate server, but for simplicity sake I installed the Production instance on the same physical server as the Development instance. It makes no difference for the purposes of this post. If you wish to follow all examples presented in the next two posts, you will need to install and configure the Production instance of SQL Server. Otherwise, you can disregard the portions of the two posts on publishing to Production, and just stick with the single Development environment. The conversion to SSDT doesn’t require the added Production environment. Next, we will create a new configuration in the SSDT project’s Solution and configure the resulting publishing profile, targeting the Production environment. We will use this to publish changes from the project to the Production environment. Using the Solution’s Configuration Manager, create a new Solution configuration. This process is unchanged from the VS 2010 database project-type. Right click on the AdventureWorks2008 project and select ‘Publish…’. This will return us to the ‘Publish Database’ window. Like before, with the Development publishing profile, complete the connection string information, this time targeting the Production instance. Change the ‘Publish script name’ setting to ‘Production.sql’. 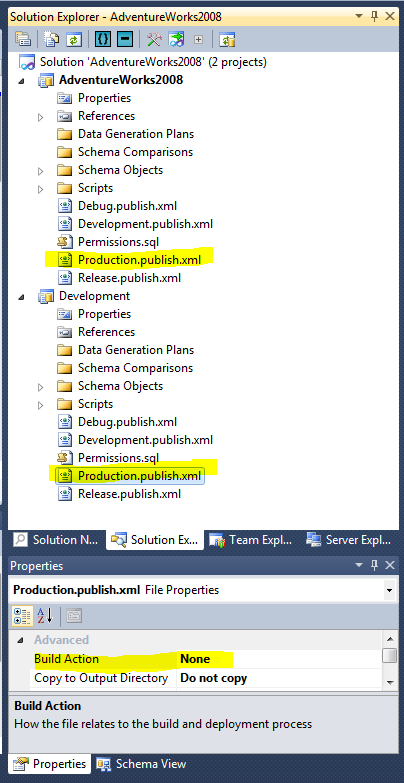 Click ‘Save Profile As…’, and save this profile configuration into the project file path as ‘Production.publish.xml’. Repeat this process for the Development SSDT server project. We now have a new Production Solution configuration and corresponding publishing profiles in each of our two projects. 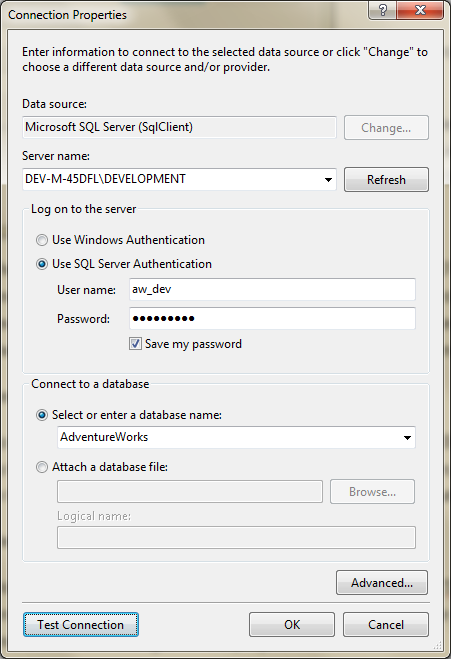 We can now target two different database environments from our AdventureWorks2008 project, Development and Production. In a typical production workflow, as a developer, you would make changes to the database project directly, or copy using a source control system like TFS. After testing your changes locally, you execute the publish task to send your schema changes and/or pre- and post-deployment scripts to the Development database instance. This process is be repeated by other developers in your department. After successfully testing your application(s) against the Development database, you are ready to release the database changes to Testing, or in this example, directly to Production. You execute the Publish task again, this time choosing the Production Solution configuration and Production publishing profile. The schema changes and any pre- and post-deployment scripts are now executed against the Production database. You would follow the same process for other environments, such as Testing or Staging. For this test, we will make schema changes to the ‘Employee’ table, part of the ‘HumanResources’ schema. 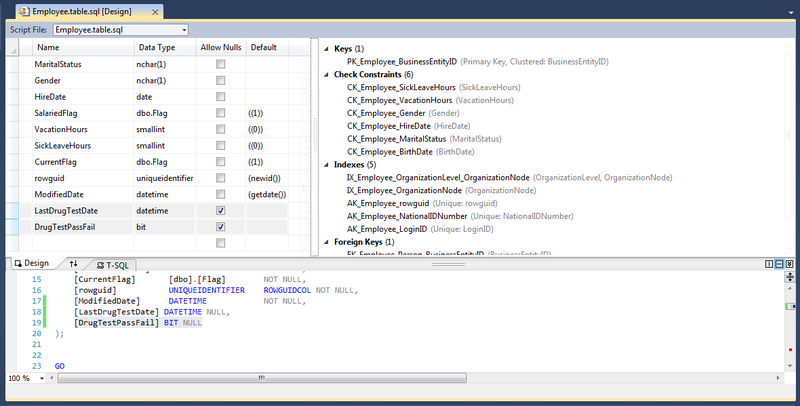 In Visual Studio, open the Employee table and add two new columns to the end of the table, as shown below. If you have not worked with the SSDT project type before, the view of the table will look very different to you. Microsoft has changed the earlier table view to include a friendlier design view as seen in SSMS, versus the earlier sql create statement only view. There is also a window which details all the key, indexes, and triggers associated with the table. I consider this light years better in term of usability from the developer’s standpoint. Save the changes to the table object and close it. Select the Development Solution configuration. Right-click on the Development profile in the AdventureWorks2008 project and click ‘Publish…’ Wait for the project to build. When the ‘Publish Database’ window appears, click ‘Publish’. You have just deployed the Employee table schema changes to the Development instance of the database. Repeat this same process for Production. Don’t forget to switch to the Production Solution configuration and select the Production publish profile. You have now applied the same schema changes to the Production environment. Your customer will be happy they can now track the drug testing of their employees. There are other methods available with SSDT to deploy changes to the database. Using a script is the method I have chosen to show in this post. 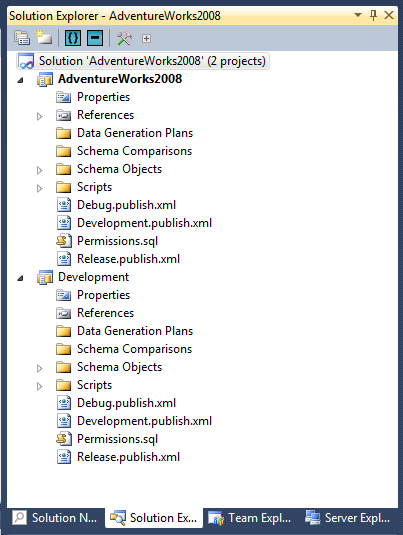 In this post we converted the Adventure Works database project and Development server project to SSDT project-types. We created a new Solution Configuration and publishing profiles, targeting Production. We made schema changes to the SSDT database project. Finally, we deployed those changes to both the Development and Production database environments. In Part III of this series, I will show how to use Jenkins CI Server to automate building, testing, delivering scripts, and publishing to a database from the SSDT database project. This entry was posted on August 1, 2012, 9:44 pm and is filed under .NET Development, Software Development, SQL Server Development, Team Foundation Server (TFS) Development. You can follow any responses to this entry through RSS 2.0. You can leave a response, or trackback from your own site. Great article so far.. very informative. Question though: why bother setting up the Solution Configurations for each environment?.. aren’t the publishing profiles alone sufficient? Short answer, because each Solution configuration stores properties, specific to each environment. They include whether to run static code analysis, which platform to use, to build or not, to deploy or not, etc. We usually have multiple databases and instances in each Solution. We also often have several environments to deploy to. Each environment has different properties. I create a configuration for each unique environment. By having the Solution configurations, I can execute a Build or Rebuild on the Solution, selecting a specific configuration. The Solution will in turn build all the dependent projects with the same configuration. Also, as you add the configuration to the Solution, it will create the equivalent configuration in each project, saving time. OK, right.. so similar reasons for setting up any old configuration for any application build. I thought there going through the motions of setting up new configurations because there was a tie in to the publish profile explicitly for SSDT but apparently there isn’t. Thanks. Jeff: Thanks for reading the post and the question. I guess I consider them related (configuration and profile), because they both contain properties specific to a database environment. 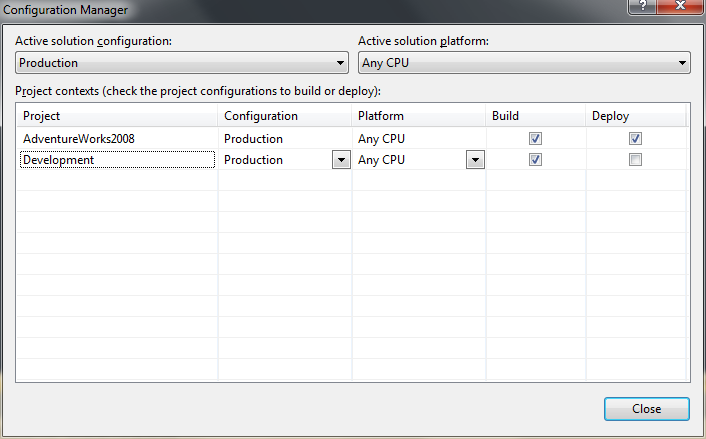 For example, the Solution configuration defines which projects build and which deploy for each config. 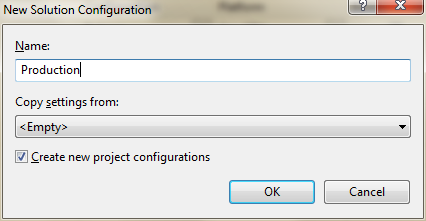 The project configuration stores the ‘Build output path’ and ‘Build output file name’. They are indirectly related to the publishing profile. The configuration also stores the specific choices I make for Code Analysis – on or off, and which rules apply, which one don’t. And, if I should treat errors as warnings.